In this age of bling, the “luxe" trend of interior design is ubiquitous in five-star hotels and luxury show homes. Designer furniture, textured wall coverings and jewelled lighting are some opulent elements. But hotel owners, seeking style for its own sake, are likely to discover that they have painted themselves into a corner, warns Carl Almeida, partner at P49 Design, a Bangkok-based interior architecture firm which has designed 200 hotels globally, 15 of them in India. Speaking last month at a seminar on hospitality design at the annual Index Furniture trade show, Mumbai, he highlighted the importance of knowing the difference between “being on trend and being trendy". Awareness of the dangers of climate change is beginning to penetrate the hotel industry. International operators are increasingly finding ways to conserve energy and water, and opting for sustainable materials in an attempt to demonstrate that hotels “can still be cool and sustainable". For example, the Starwood chain of hotels is piloting a Green Choice programme in Seattle, where guests are rewarded with points for choosing to reduce chemical consumption and water usage by minimizing housekeeping. Although Almeida remarks “that this trend is still in its infancy in India", it is already visible. The boutique Park Hotels group will inaugurate a new LEED-certified hotel in Hyderabad later this year, one of the first of its kind in the country. The group estimates that it will reduce power consumption by 30% and potable water consumption by 40% through greener building design, construction and operating activities. Globally, new hotel brands are being launched that are more reflective of the target group, rather than the destination. One P49 client is an international hotel chain wanting to create a new brand aimed specifically at guests who consider themselves “forever 34", says Almeida. This brief translates into a look that is “natural, organic and locally inspired" and is aimed at travellers who may be older, but consider themselves young at heart. A target market-focused strategy allows hotel operators to differentiate themselves and “not make the mistake of being all things to all people", he explains, citing the example of long-standing groups such as ITC and Oberoi, which are conceptualizing new brands, and the expansion of groups such as the budget Lemon Tree chain. 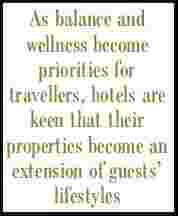 As balance and wellness become priorities for international travellers, hotels are keen that their properties become an extension of guests’ lifestyles. “Lobbies are multi-zonal, for work, rest and play; food is healthy and spas are essential. Some have an entire floor dedicated to a spa, which can return more money than a guest room. Hotels realize that guests are beginning to pay more for the lifestyle afforded by a larger room, rather than wanting them to go out and spend more in a restaurant," says Almeida. The Taj group was one of the first to recognize the growing demand for wellness therapies among its guests and introduced the Jiva spa in its 20 most upscale properties. “Jiva is the only Indian spa brand in the world with unique Indian signature spa therapies," says Sarita Hegde Roy, the group’s director of public relations. The hotel seeks to provide a holistic spa experience by using Jiva-branded personal care products, organic linen and clothing, and providing cuisine that promotes wellness. P49 also recently designed what Almeida describes as “a good spa by international standards" for the Radisson in Amritsar and a 22,000 sq. ft spa in Alibag, near Mumbai.